The molle large rucksack, on its own, has a capacity of 4000 cubic inches. The large rucksack’s main body has a zippered internal load divider and openings at the top and bottom ends, to allow a sleeping bag (or other gear) to be loaded and unloaded independently without the need for an external “sleeping bag carrier.” The top flap of the large rucksack is a mesh pocket for small reference and information materials. It is secured with a hook and loop closure. The complete large rucksack assembly has two large, removable “sustainment pouches” (included) which attach to the sides of the ruck using the same polyethylene-reinforced webbing strap and ‘push dot’ security snap system characteristic to the molle flc system. These sustainment pouches each contain two d-rings on the sides, which allow them to be carried by a “general-purpose sling” for alternate uses and each provides an additional 500 cubic inches’ storage space. 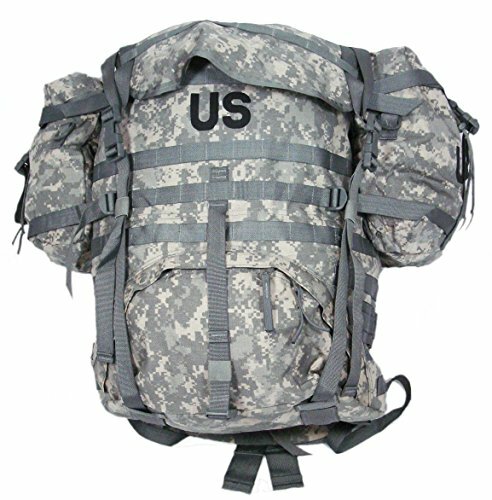 The molle assault pack and waist pack are not included as components of the rucksack, but can be attached to it, if desired. The complete molle ii rucksack assembly has 5 major components: 1 x polymer gen-iv molded frame 1 x molle large rucksack fabric body 2 x molle sustainment pouch 1 x molle large rucksack molded waist belt 1 x molle large rucksack shoulder straps (set) note: the entrenching tool case and molle entrenching tool pouch are optional accessories which are not part of the complete molle ii complete rucksack assembly.